For German manufacturers, the most important racing championship in the world is the DTM. In English, that acronym translates into “German Touring Car Championship,” and every win in this series bestows bragging rights on the company that finishes first. 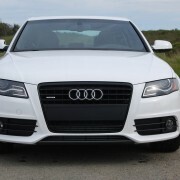 For years now, the winning company has been Audi, and the winning car has been the A4. After spending a week in a well optioned A4, it’s not hard to see why this model wins the DTM so often, over fierce competition from Mercedes, Opel, and now, BMW. 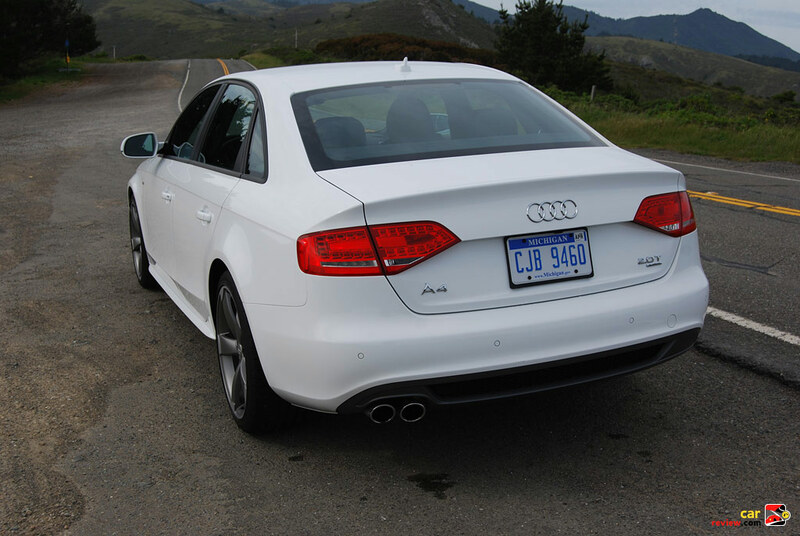 A properly equipped A4 is one of the best sports sedans in the world, and also one of the most affordable. Over the years, the A4 has grown marginally in size, to the point where it’s now nearly as large as its bigger brother, the A6, once was. 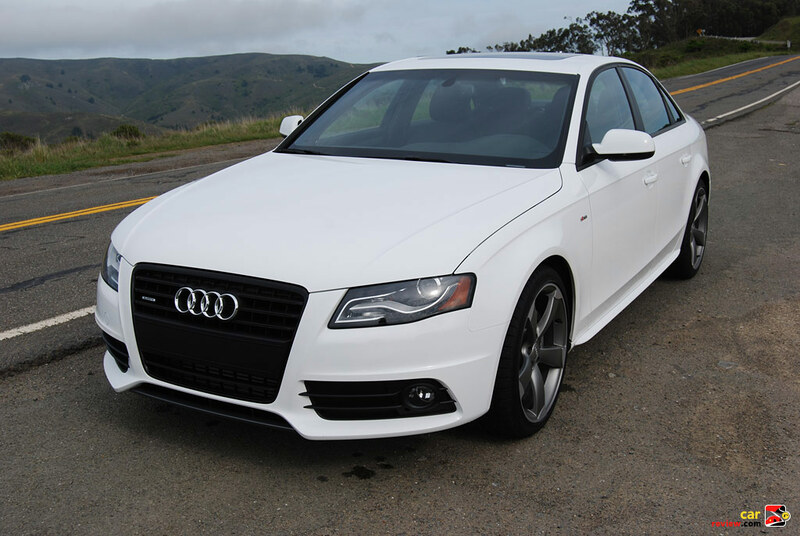 With an overall length of 185” and a wheelbase of 110” the A4 serves well as a 5 passenger sedan, with enough trunk space and interior room to keep all occupants happy on long trips. 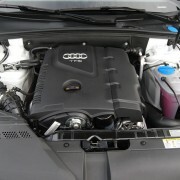 Given its 16.9 gallon tank, and highway mileage of 31 MPG, the A4 is capable of traveling over 500 miles between refills. 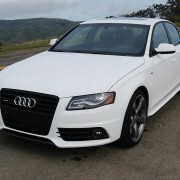 If your A4 is equipped like our test car, you will relish every one of those miles. Let’s start with the base price of just $33,300. 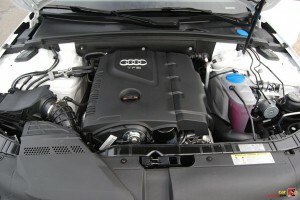 That buy-in gets you the base powerplant, a 2.0 liter, turbocharged in-line 4 cylinder motor that produces enough horsepower (211hp) and more than enough torque (258 lb.-ft.) to cope with any driving need. The base package also includes an ultra slick-shifting 6-speed manual gearbox, with well-defined gates between gears, well-chosen gear ratios, and an easily modulated clutch that makes choosing a gear a joy rather than a chore. But you’ll want to enhance your A4 experience with the $9,500 optional “Prestige model” group, which includes 3 auto-dimming rear view mirrors, a driver information center with trip computer, heated front seats with memory settings, split/folding rear seatbacks, adaptive xenon front lights with LED daytime display, remote keyfob actuation, audible rear parking sensors, and a killer Bang & Olufsen sound system. Tack on another $1,250 for the sporty S-line package that adds stunning “Rotor” design 5-spoke 19” alloy wheels, special leather and Alcantara seat dressage, and slick brushed aluminum swaths on the doors, dash and center console. On top of those choices, be sure and check the box for the Sport Package, which embellishes the front seats with 4-way power lumbar adjustment, and adds a perfectly designed 3-spoke S-line steering wheel to the mix. Most importantly, the Sport Package revises the suspension geometry with stiffer springs and shocks. At just $750, this addition is the most compelling buy on the order form. 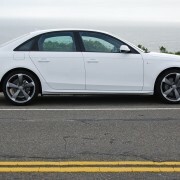 If you order your A4 as outlined above, you will park in your driveway the choicest German sports sedan you can imagine. Use it to take the family on a long trip down Interstate 5 to LA, and you’ll be thrilled with its economical aptitude for long distance cruising. 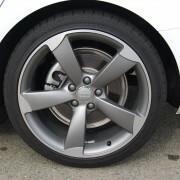 Or if you’re a devotee of the DTM, put this A4 to the use for which it was designed: back road burning par excellence. 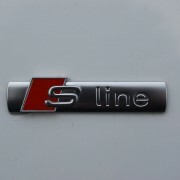 The S-line A4 is really all about perfect balance. The sports suspension, the Rotor alloys, and their 255/35ZR19 ContiSportContact 3 tires can come to grips with anything a curvy road can throw at them. The quattro all-wheel-drive system, with its sporty 40% front/60% rear bias, gives you enough latitude to toss the A4 around like a sports car, yet steps in to save your bacon when you lose adhesion. 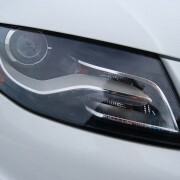 The super fat power and torque bands afforded by the turbo motor mean you’re never at a loss for grunt. 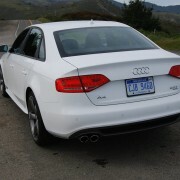 All in all, the A4, with the proper equipment added, is a heavenly gift for the sporting driver with family requirements.